Norwich XI: Ruddy, Martin, Klose, Bassong, Brady, Howson, O'Neil, Redmond, Hoolahan, Naismith, Jerome. West Ham XI: Adrian, Byram, Collins, Ogbonna, Cresswell, Noble, Song, Obiang, Antonio, Valencia, Payet. "Norwich will be gutted they did not win the game and West Ham will be gutted they didn't not win it with the amount of chances. A point does not do either side any favours in terms of climbing the table." Two late chances and a corner for Norwich but they fail to take them and have to seetle for a draw which will feel like a defeat. That's all from this game but you can follow reaction to Saturday's games here. "How many more chances do West Ham need to win this game, they have had numerous chances and Norwich have self-destructed." "I think Norwich are down if they don’t get a win today. I just think you look at Liverpool 3-1 up last week and lose, two goals up today, this will do Norwich so much damage psychologically." "More like Eminem than Emenike, what a chance that was. He completely missed his kick. John Ruddy was the most surprised man on the pitch as the ball bounced in into his hands." What a chance for West Ham. Andy Carroll gets a flick-on and Emmanuel Emenike has to just slot in from close range but the substitute only manages to trap the ball and allow Norwich keeper to gather. "Good response from Norwich, at 2-2 there looked like there would be only one winner. 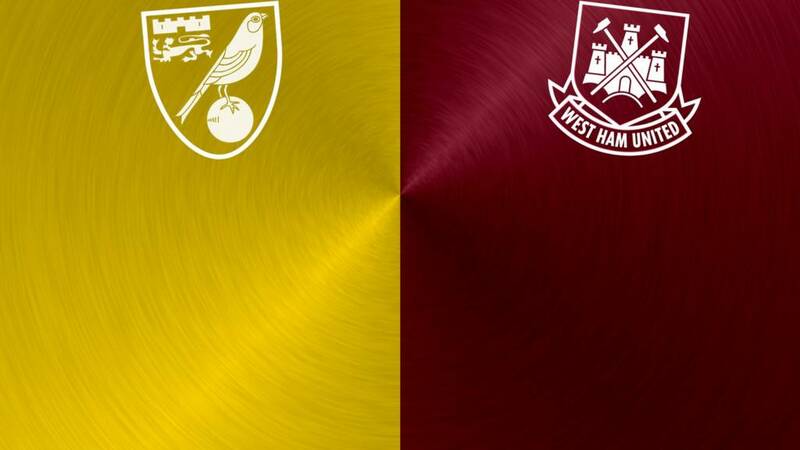 "But West Ham have taken their foot off the pedal and Norwich have come back into it. It will be an interesting six plus minutes, a draw would not suit either team." King 6: Why can't Alex Neil walk the dog? Because he can't hold onto a lead. Adamski: He's tried it a couple of times recently but he's rifled it in this time-what a strike Mark Noble! Double change for Norwich. Dieumerci Mbokani and Graham Dorrans come on for Cameron Jerome and Wes Hoolahan. All West Ham now. Norwich are rocking - and not in a good way. "What did I say about shades of the Liverpool match for Norwich. "Out of nothing Norwich have conceded a goal and now it is 2-2. It is amazing what a goal can do for confidence. "Norwich should not be in this position but they are, only one team looks like going on to win it and that is West Ham." Dimitri Payet has come to the party for West Ham. He receives a ball from Andy Carroll and pulls a pass back into the run of Mark Nobel, who sends in a shot from the edge of the area. A lifeline for West Ham. Victor Moses powers forward on the left, cuts inside and, despite the attention of plenty of Canaries defenders, gets away a shot which keeper John Ruddy can only deflect into the run of Payet, who slots home. West Ham striker Emmanuel Emenike comes on for Michail Antonio as the visitors make their third and final substitution of the game. "Norwich have dominated this second half. "The difference in this Norwich side since they scored the first goal, the confidence is flooding through the team. "West Ham have brought on Andy Carroll and might go route one. "Norwich were up against Liverpool and lost so they have to see out this match." "He is offside. It was good build up play, nice sharp passing but West Ham look leggy. The shot was blocked and he was definitely in an offside position." Wes Hoolahan played the ball to Steven Naismith and carried on his run into the West Ham box. Naismith went for a shot from the edge of the box and his effort deflected off James Collins into the path of Hoolahan, who sidefooted in from close range. There were plenty of glances at the assistant referee but no flag went up and the goal stands. "It was a brilliant goal from Robbie Brady he bends in off the under side of the bar but you don't know with Norwich, can they hold on here?" West Ham striker Enner Valencia is hobbling around after coming off worse in a challenge. He is replaced by Andy Carroll as Hammers boss Slaven Bilic also brings on Victor Moses for Alex Song.